Superlight 2 Part High Performance Wood Filler has been specially developed using lightweight particle medium to provide a high performance wood filler that is exceptionally easy to sand down and that will accept all types of wood stain offering a superior level of stainability than heavier particle fillers. The lightweight nature also provides excellent slump resistance in vertical joints and allows deep gaps to be filled in one go. 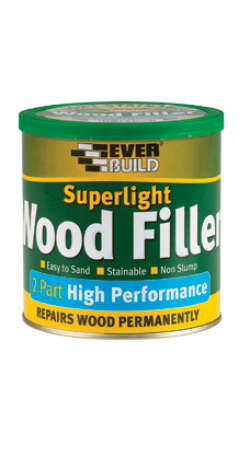 Once mixed the filler sets hard to provide a tough, long lasting repair to all woods, can be used to any depth.